There’s little debating that Angelique Kerber’s start to the year did not unfold as she had hoped. A Top 10 stalwart since her surprise surge up the rankings in 2012, the 27-year-old German found her ranking tumble from the WTA’s elite after a string of defeats and early exists. By the end of the pair of March mini-majors, she had failed to defend two large finals appearances, or make any impact at the noteworthy Premier events. And then there was clay. Well, slick green clay, but clay nevertheless. 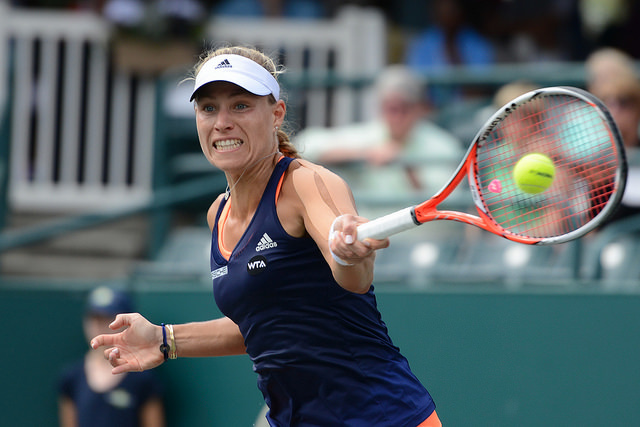 On the crushed rock of the Family Circle Cup, Kerber survived a scrappy opening match against Evgeniya Rodina in Charleston, but slowly rediscovered the unique counterpunching that — since her run to the 2011 US Open semifinals — saw her notch wins over nearly every member of the current Top 10. Currently riding a 10-match winning streak on what had been her least favorite surface, Kerber’s renaissance has featured several high quality matches, along with the return of her unconventional yet nevertheless lethal forehand — the focus of this week’s #SaturdayNightShots. Kerber has been bafflingly consistent over the years. While criticisms of her game often extend to her weak serve and occasionally passive play, her lefty forehand is an improbably world class shot, one that can keep her in rallies, or help her end them. Before picking apart the technical uniqueness of the former World No. 5’s forehand, one must first understand that she is not naturally left-handed. In an interview with The Times’ Marv Salter, Kerber notes that her childhood decision to play lefty was hardly a strategic move. With her dominant hand, then, working her backhand side like a hockey stick, Kerber’s forehand naturally possesses technical quirks that allow her to hit — with shocking consistency — one of the flattest down-the-line forehands in the game. The Kerber forehand has an incredibly short and abbreviated backswing which, while denying the shot very much shape, allows it to be hit with both speed and disguise. The German’s signature leg strength provides much of the power that goes into her attacking forehands, as she seemingly launches her body forward with a baseball bat slap of a swing across her body. This highlight reel forehand down-the-line is undoubtedly Kerber’s money shot, often using it whenever she gets a short reply from her opponent. Her tendency to follow this trajectory off her forehand may be common knowledge. Yet it is the combination of pace, accuracy and depth of the shot that is often difficult for opponents to handle. Kerber’s offense off this wing, however, is interestingly limited to parallel shots – her cross-court forehand is surprisingly weak, which likely has something to do with her “unnatural leftiness.” With her down-the-line forehand, she’s able to use her leg strength to generate pace, while with the cross-court variation, she usually limits herself to her lesser upper body strength, creating a weaker shot — the same issue, coincidentally, affects her serve. Remedying a weaker cross-court forehand, the former Wimbledon semifinalist employs the use of sharp angles, which gain an extra tactical benefit from being left-handed. She tends to hook around the outside of the ball to open up the court, allowing for a flat backhand or inside out forehand to finish off points. While this year’s Charleston champion and Stuttgart finalist might be capable of such attacking tennis, her true merits lie in the way she is able to defend off her forehand. Despite not being naturally left-handed, Kerber has incredible feel off her forehand side, particularly when it comes to redirecting pace. The aforementioned abbreviated swing allows her to hit defensive shots in spite of acute time constraints, rendering her capable of hooking shots back into court from ridiculous positions or reflect literal screaming winners down the line. Down-the-line. She’s capable of hitting this shot with alarming consistency, pace and accuracy from any ball left short or with minimal pace. Despite being a more instinctive counterpuncher, this is the shot that the German is most capable of generating her own page with, and is her No. 1 weapon. Improvisation. The combination of an abbreviated backswing and exceptional feel on Kerber’s southpaw forehand allows for a variety of improvisational shots from even the most defensive of positions. When given a target on her forehand, she is often able to find just enough space to find a winner or a passing shot. Defense. At its best, the Kerber forehand is a brick wall that rarely breaks down or lands short. When defending, she can redirect her opponent’s pace down the line, or hook the ball sharply cross-court with deadly spin. Errors come when she tries to go for too much, but typically her patience allows her to outlast most of her competitors. Cross-court. Kerber is quite simply not comfortable generating pace across the court. While she is certainly able to hold her own in cross-court rallies, she rarely hits winners in that trajectory, unless she can manage to wrong-foot her opponent. Impatience. Being her primary vehicle for aggression, the forehand can break down in the atypical moments where her opponents can outlast her in rallies. This impatience typically manifests itself in Kerber’s “Duncurrber” (see: “doesn’t care”) alter ego, in which she is likely to throw caution to the wind — for better or for worse — and becomes tempted to go for her big down-the-line shot too often and too early. At the peak of her 2015 slump, her forehands were missing the very lines they once (and now) masterfully painted. What do you think are the keys to Kerber’s forehand? Sound off in the comments!